There is a growing interest at different decision-making levels (EU, international and national) in using liability as an element in solving the legal problems of environmental harm. The interest is founded on the necessity to take into account of complex inter-dependencies and interrelationships between the environmental media at global, regional and national levels. In an effort to implement the aims of sustainable development, new views of the traditional liability instrument have to be applied. The book focuses on the Environmental Liability Directive 2004/35/EC (the so-called “ELD”) on the prevention and remedying of environmental damage, and evaluates as to whether the ELD has achieved its goals and maintained its ambitions in terms of environmental protection, and what the optimal level of harmonization in terms of environmental protection is. rigorous fashion, law, political science, technical elements of economy, insurance law and natural science, is, in the research design of this study, necessary, in a view of tackling the topic in a scientific problem solving-oriented approach. The book draws the overall conclusions by suggesting proposals for amendments and recommendations to be utilized for possible redrafting of the ELD’s provisions for the time when the ELD will be object of a procedure of revision. This book will be of interest to practitioners in EU law and EU Environmental law, international environmental law, legal experts on the law of environmental liability, specialists within international organizations but also by political scientists, economists, insurance law specialists, and natural scientists. Part I ‘What’ and ‘How’ in the Multilevel Environmental Liability Regime. 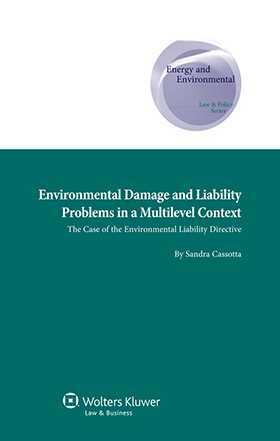 Chapter 1 Setting the Field: Environmental Law and Policy on Environmental Damage and Liability Problems. Part II Matching Theory with Facts: Building the Framework. Chapter 2 In Search for a Framework of Analysis: The Focal Points at the EU, International and Domestic Levels. Chapter 3 The Liability Directive from an Historical-Comparative Perspective. Chapter 4 Institutional Interactions in the EU Environmental Liability Regime-Formation. Chapter 5 The ELD on the Prevention and Remedying of Environmental Damage. Part III Implementation of Law and Policy at the Domestic Level. Chapter 6 Implementation of the Environmental Liability Directive: The Italian Example. Part IV Recommendations, Amendments and Perspectives.